So it was another "boring" week with a price advance that is giving traders a lot of reasons to be on both sides of the fence, but as long as current liquidity dynamics are maintained, we'll keep our ongoing blueprint of "short and shallow corrections with any surprises to be to the upside" until the market begins to tell us to the contrary. So much for being boring! Taking the old adage of "never short a dull market" and tossing it in the garbage, the major indices of the US equity markets lost an average of 3.31%, week over week, giving back all that was gained over the last 6 weeks with a resounding closing thud at Friday's bell. Leading the way lower was the broadest based barometer of market activity, the New York Composite Index, with a 4.28% haircut, while the NASDAQ Composite Index brought up the rear with a 2.66% loss for the week. 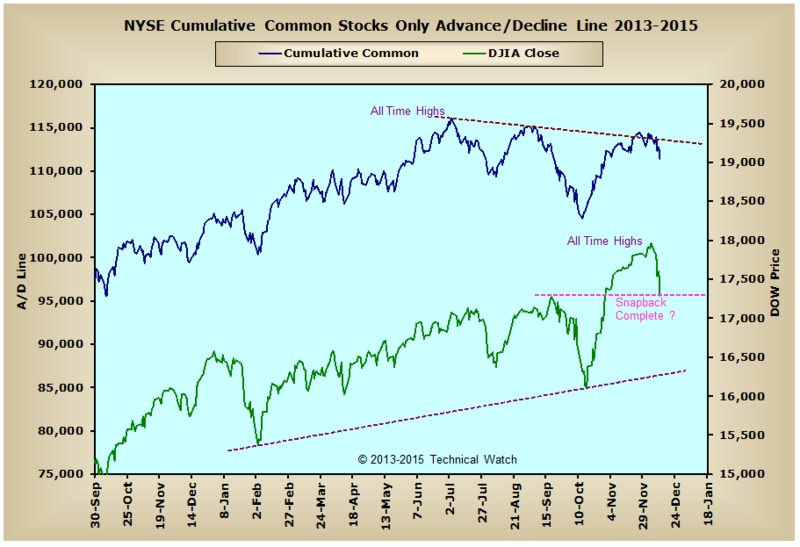 On the negative side of things, this past weeks sell off took nearly all of the cumulative breadth and volume charts out of their bullish configurations and this pushed the BETS indicator to a -40 reading - the most negative reading that we've seen since the major price lows of June 1, 2012. 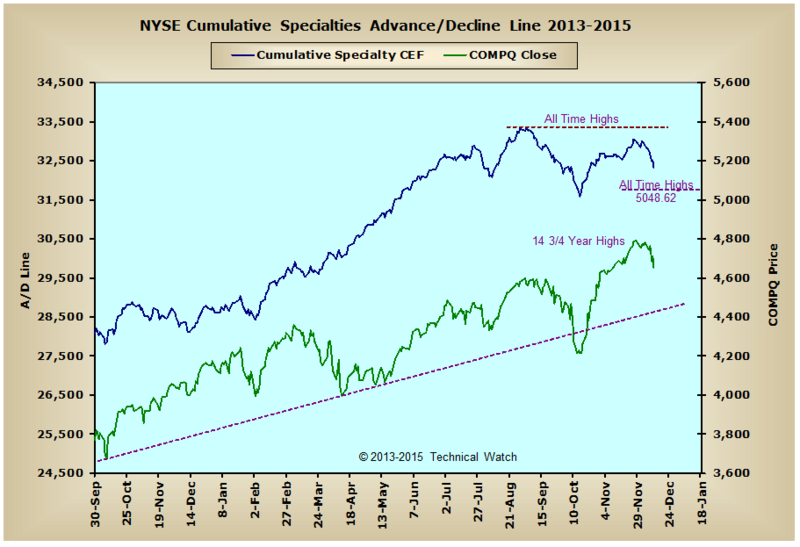 Also of note on the cumulative data is that we see that money was unable to push both of the NYSE Composite breadth and volume McClellan Summation Indexes above the area noted as the point of "escape velocity". 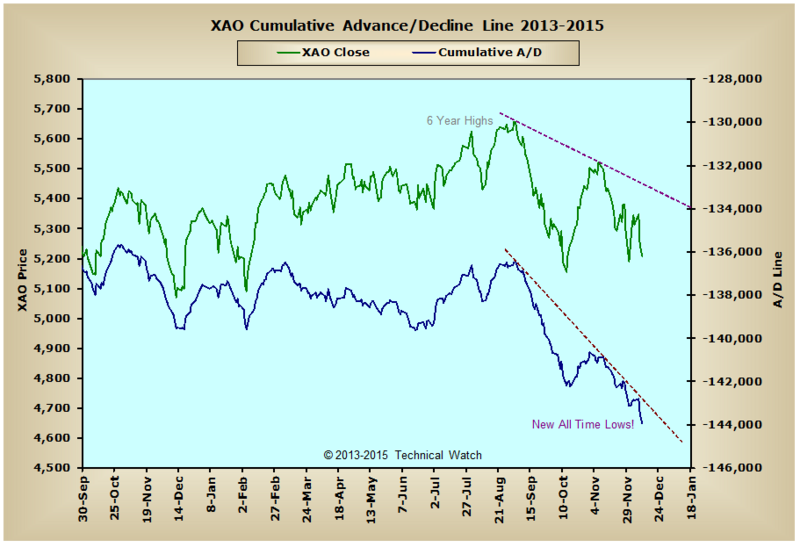 This "failure to achieve" in moving above the +600 level, along with our subsequently moving down and through the +500 level this past Thursday, strongly suggests that it's now going to take at least another week or so before we're likely to find our sea legs again with a zero line test probable. Looking at our weekly breadth charts array shown below, and we see that both the NYSE Common Only and NYSE Specialty CEF advance/decline lines are now showing divergent tops in their structures, while the Aussie advance/decline line moved into new all time low territory in sympathy with this past week's global equity price weakness attributed to crude oil's 12.40% decline. Speaking of crude oil, the numbers of the last several months have been rather astounding with the month of December now showing a decline of 12.88% - pushing the 4th quarter decline to a jaw dropping 37.05% - and we're now down 41.75% since the beginning of the year! Truly one of the great surprises of 2014 given all the highly negative political discourse we had with regard to this same commodity...especially during the 1st half of the year. But there are some positives here, so let's review them as well. 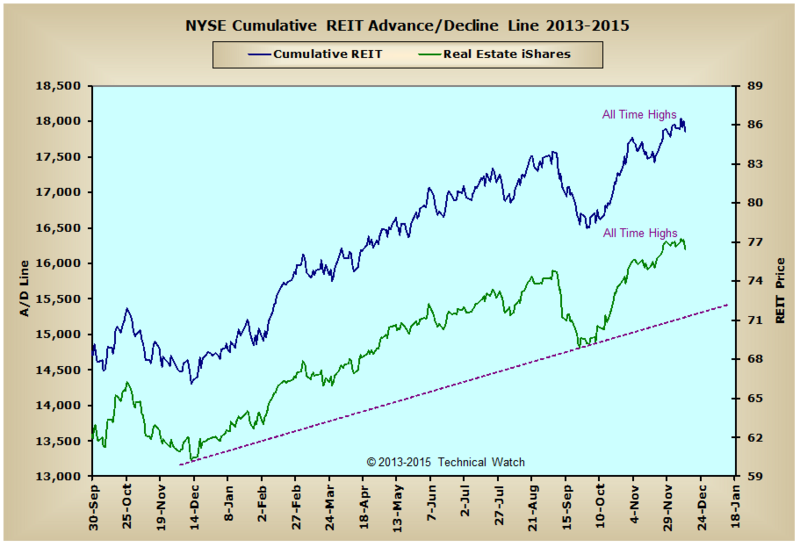 First and foremost is that the NYSE Composite, NYSE Preferred and NYSE REIT advance/decline lines all remain well above their rising bottoms lines with the REITS actually moving to new all time highs as recently as last Tuesday. 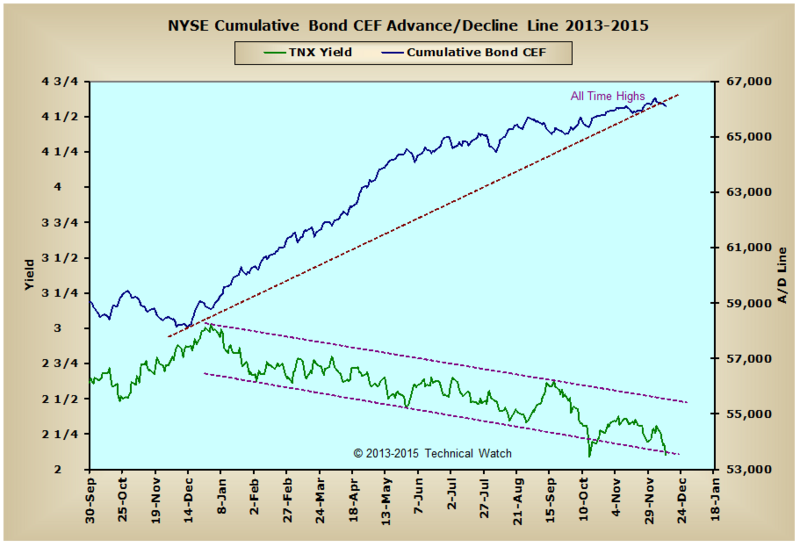 Even the NYSE Bond CEF advance/decline line continues to maintain a positive angle of ascent although its rising bottoms line was violated by the sideways movement this past week in the cumulative numbers. Another positive here is that the yield on the 10 year note moved to its lowest level since October 15th leaving the bond pit's fear of stronger economic activity from last month's jobs numbers a fading memory. 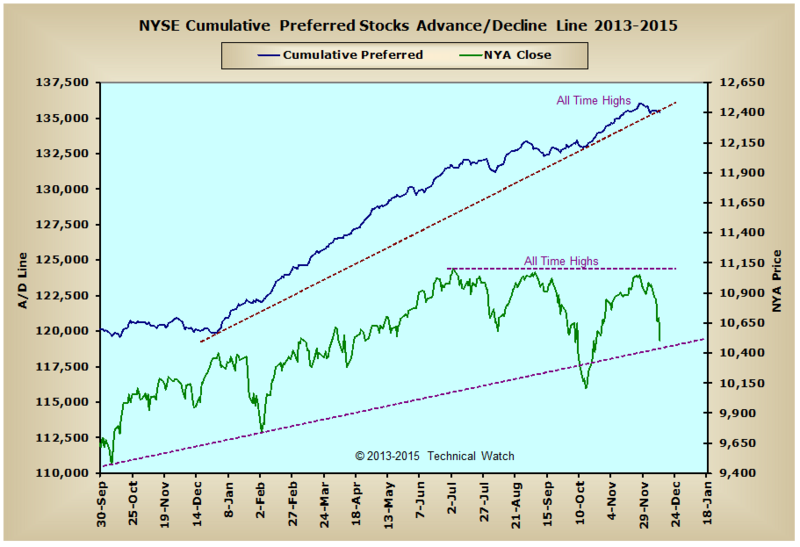 Yes, some of this downside acceleration could be part of a flight to safety given the markets hard reversal this week, but as long as the NYSE Bond CEF A/D line continues to climb, this instructs that not only will interest rates continue to be well behaved at current levels, but it also promises us higher equity prices once the market moves on from its current indigestion. Another positive is that price is showing more downside amplitude (too far, too fast) in relation to the amount of money moving out. 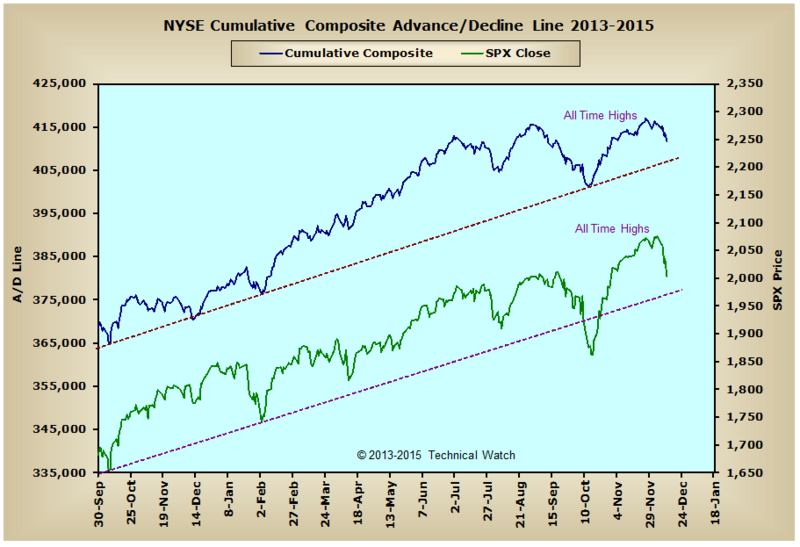 Because of this, we should see a technical "reset" near term so that this same breadth to price relationship can be in a more proper alignment to each other (breadth leading price). 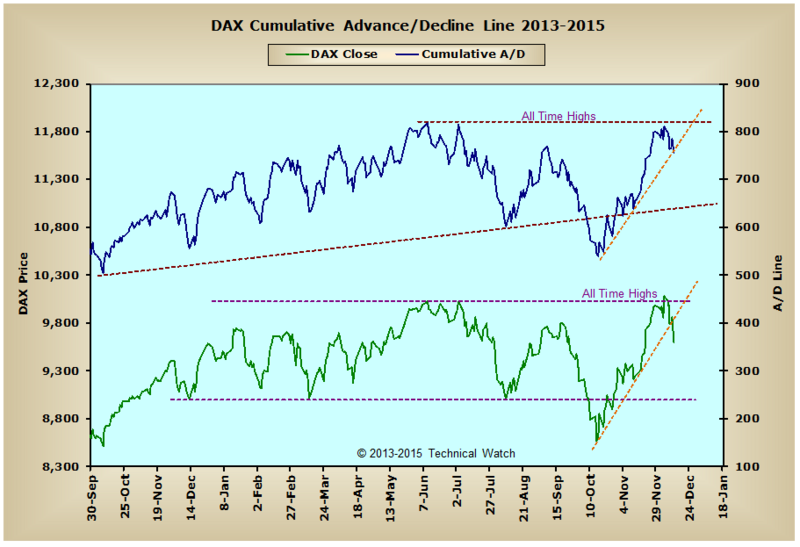 Over in Europe, the DAX advance/decline line is actually showing a more bullish pattern right now as it continued to hold above its rising bottoms line even though the price index itself was down 4.88% for the week. 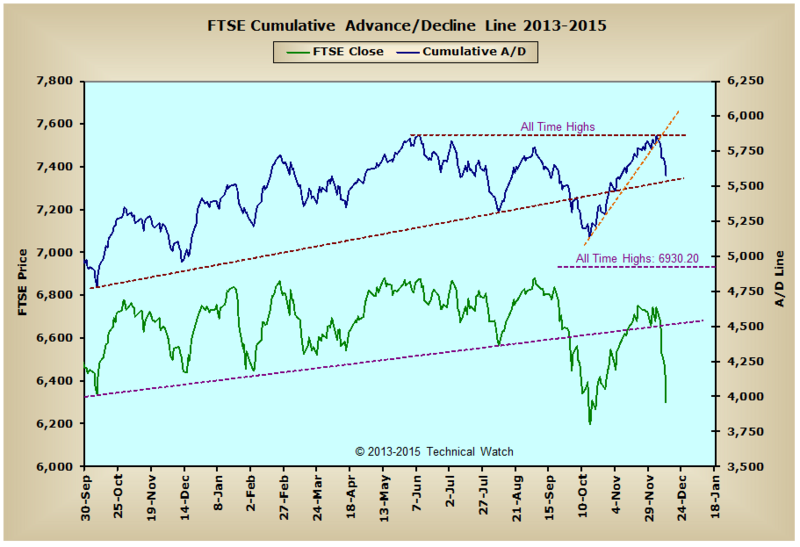 The FTSE advance/decline line also had a negative week, but here again, we see that the downside action in the FTSE's 6.56% weekly decline in prices got well ahead of itself in relation to this same money flow dynamic. Because of these important technical inconsistencies, it wouldn't be too surprising to see an equal and opposite move to the upside during the upcoming week of trading to fill the void created by this same lack of monetary leadership. 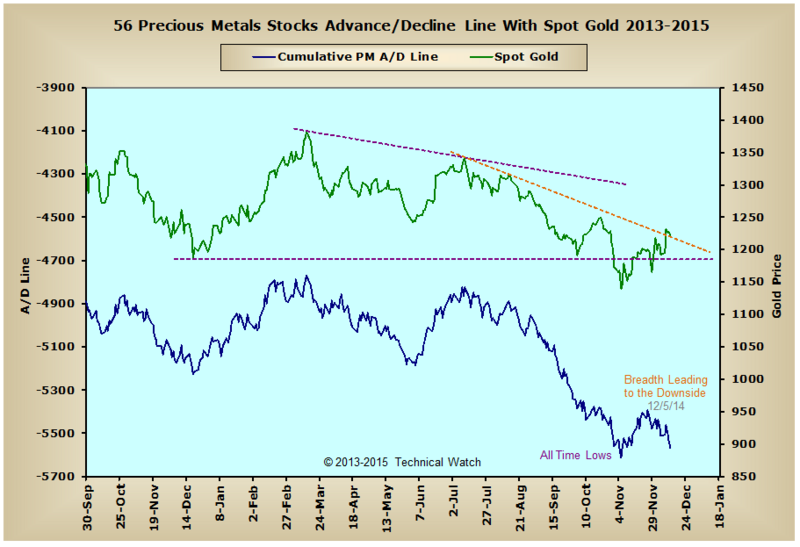 Taking our weekly look at the precious metals and we find that the price of gold was up another 2.47% (and nearly 5% for the month) and this pushed the metal's price pattern structure to just above the intermediate term declining tops line noted in orange on the Precious Metals advance/decline line chart. Unfortunately for the gold bulls though, we also see on this same chart that the direction of money flow continues to move out of these same stocks causing a highly negative technical situation that usually ends badly for the commodity itself. 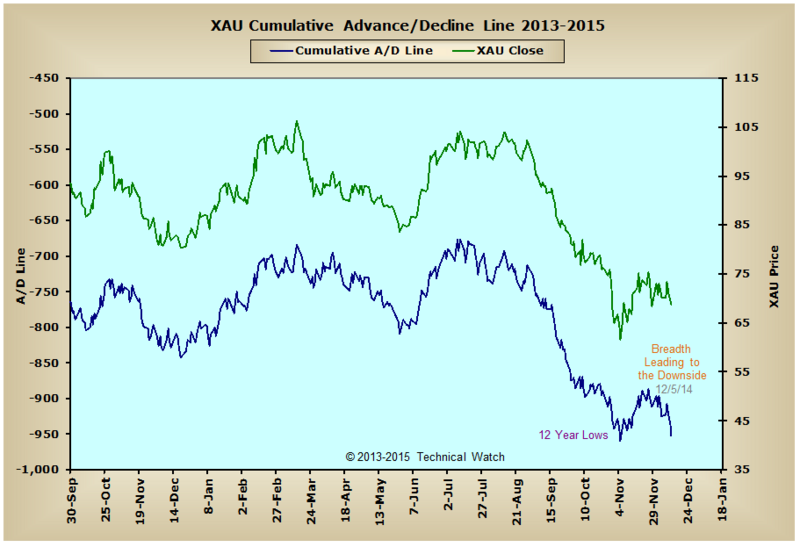 Take this and the fact that the 16 stock XAU advance/decline line is actually leading the broader based basket of 56 stocks to the downside, along with Canada and Australia's continued weakness in their money flow lines, and this highly suggests that that the rising price of both gold and silver are likely to fail at current levels, and then begin to play an exciting game of catch up to the downside. Stay tuned. So after 7 weeks of frustration, the sellers were finally rewarded as they were able to push prices in their direction, although, it wasn't until Friday where they had their real success in doing so. As has been mentioned in our chat discussions, the decline in prices has also pushed option sentiment to bullish readings as speculative put buyer was ramped up this week with the negative action. In fact, put buying was at such a frenzied pace this past week that the 5 day simple moving average of the ISEE matched its all time lows on Friday with a reading of 68. Keeping in mind that any number below 80 in the ISEE and we usually see a price bottom a week or two after it's generated, along with the NYSE TRIN moving to a highly "oversold" number of 3.47 on Wednesday, and these are the kind of indications from where important price lows are eventually seen. Add to the mix that liquidity remains more than ample in the interest rate sensitive issues to keep the cost of money fluid, and the lack of money moving out of the growth market in direct relation to the value issues, all point to last week being that of a corrective process and not the start of a change in the trend in the marketplace. However, any further damage to where new lows are seen in any or all of the McClellan Oscillators would be a "game changer", so we'll see how things go as we move into our final quarterly OPEX period of the year coming next Friday.